I'm not normally a fan of high text picture books, unless they're historical or specifically information-packed, but this lolloping story, although disjointed at times, does work well with its warm and entertaining dialogue between a little girl and her dad. Tora is very excited. Normally her dad is very boring--working, sitting at the computer, drinking coffee--but something great is about to happen. A trip to the forest to see wild animals! Boring old Dad, of course, has to plan carefully for the trip. Off to the supermarket for groceries they go. When they finally reach the forest, Tora is thrilled to see some cool animals, but Dad is always on his GPS or on the phone, and always misses them. When he does bother to look up, he's not overly impressed by the magical world Tora sees - hippos instead of a pile of boulders, giraffes instead of a snaggle of trees, trolls instead of a clutch of trees stumps. Dad seems so distracted, he nearly mistakes a crocodile for a log! But tough little Tora comes to the rescue. Finally, the duo settle into their campsite for the night--and Tora's childhood imaginings continue as they gaze over the landscape, creating a magical wilderness from the everyday. 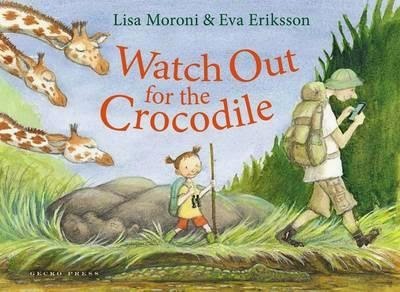 Eriksson's gorgeous illustrations beautifully interpret the text of this book, making for a sweet outdoor adventure between dad and daughter.